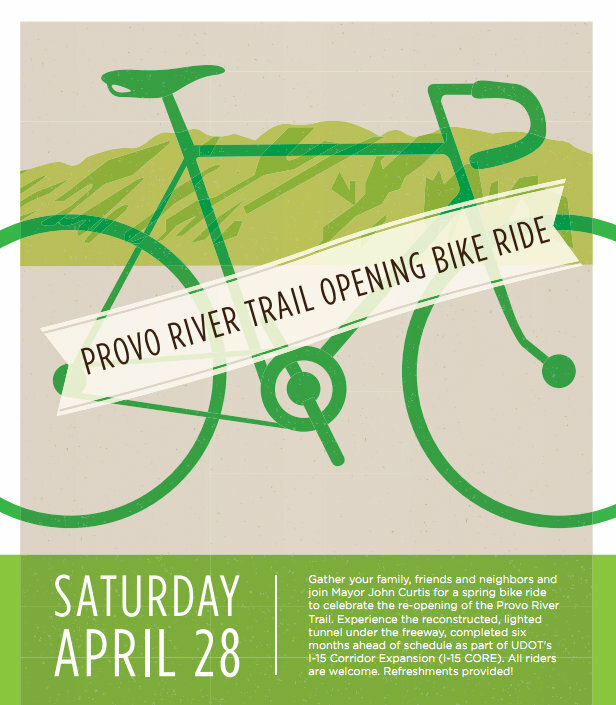 Gather your family, friends and neighbors and join Mayor John Curtis for a spring bike ride to celebrate the re-opening of the Provo River Trail. Experience the reconstructed, lighted tunnel under the freeway, completed six months ahead of schedule as part of UDOT’s I-15 Corridor Expansion (I-15 CORE). All riders are welcome. Refreshments provided. Come for the whole ride, or choose the ride length that best works for you and your family. We’ll start at 11:00 a.m at the mouth of Provo Canyon, will ride by 2230 N. and University Ave at 11:15 a.m. and will be at Paul Ream Park on the trail for the Grand Opening Event at 11:30 a.m. Come out to support bikes and projects like this in Provo! Can’t wait to see you there! This entry was posted in Kids and Family Cycling, Local Biking Events, Provo Bicycle Projects, Provo Bike Committee, Provo River Trail by Jamie. Bookmark the permalink.